January's darkness still cloaked the ridges of Sonora's Sierra Madres when we reached the summit of a commanding knoll. We set up our spotting scopes, but it was too early to see, so we kicked back and watched as black turned gray, then golden as the sun peeked over the eastern horizon. A decade since I'd seen dawn in Coues deer country. I'd forgotten how much I missed it. 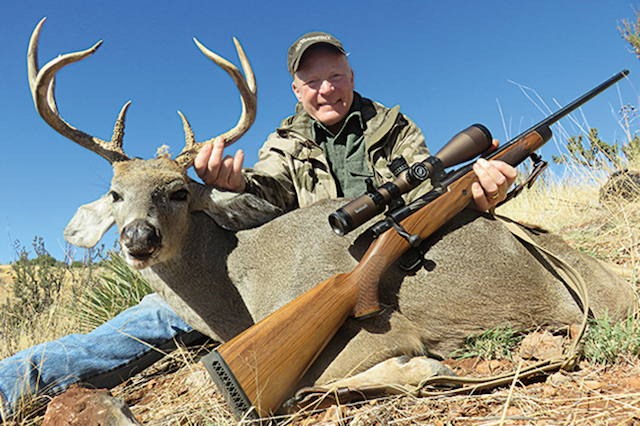 Guide Charles Oberly, from Montana, had a few Coues deer seasons under his belt. Still, I figured I could hold my own spotting deer. At first that worked pretty well. It was still gray when I saw the first deer, a doe crossing a ridge behind us. At 10X she was a mouse-like form moving through yellow grass. Maybe I saw the second one, too, but then younger eyes and recent practice bypassed experience. The deer were on parade, and as the sun hit the lower ridges, they gleamed like silver dollars. Charles found most of them first, some at great distance, others right below us. Two hours after dawn and we'd glassed more than 20 deerâ€”at least a half-dozen small to medium bucks. Going back 40 years, I wasn't sure I'd ever seen this many Coues whitetails from one vantage point. Clearly, we were in a special place. Elliott Coues (1842-1899) was a U.S. Army medical officer and naturalist of the U.S. Geological and Geographical Survey of the Territories (1876-1880). Coues pronounced his name "cows," which is thus correct, but today it's common to say "cooz." During his wanderings in the Southwest, he observed a small, iron-gray deer with a long tail and big ears. It was very different from the "Virginia whitetail." The Coues whitetail has a distinct range, usually found in mountains, in elevations from 4,000 to 8,000 feet. It is ideally adapted to desert environment, thinly distributed in arid habitat. The Coues whitetail not only is smaller, but also follows Bergmann's Law perfectly, with outsized tail and ears for heat dissipation. Hunting this gray ghost offers a marvelous experience. With comparatively light pressure, Coues whitetail are not nocturnal or crazy-wary. Once located, they can often be stalked, but they are thinly distributed in vast habitat and are small and well camouflaged. I have never experienced a more optics-intensive hunt. I first hunted Coues deer in 1978, in Arizona's Chiricahua Mountains, with Marvin and Warner Glenn, also legends. We got a nice buck, and I fell in love with the desert mountains, missing few seasons over 30 years. Arizona tags soon got hard to draw, so I switched to Mexico. Over the years, I've hunted many times in both Sonora and Chihuahua. In January 2018 Mossberg's Linda Powell and I found ourselves hunting the Gray Ghost on Rancho Mababi, in northeastern Sonora, outfitted by Ted Jaycox of Tall Tine Outfitters (talltine.com). Rancho Mababi really is a special place, made more so by its owners, Roberto and Alice Valenzuela. Both were in the middle of successful careers in Silicon Valley when the ranch needed to be managed. They decided to return and, decades later, are still there. Like ranchers the world over, Roberto and Alice faced a dilemma. How do they maximize yield from their land? In addition to livestock, at Rancho Mababi they bring in carboneros to make charcoal, grass-cutters for thatch, and gringos to harvest game. Previously, most of my hunting in Sonora had been on the west side of the Sierra Madres. Here on the east side, the country seemed gentlerâ€”more grass, less cacti, and much of it not as steep. It's still a tough hunt, and footing in crumbling granite is murder, but there aren't as many thorns. My guess is this country supports a higher density of deer. Mind you, this is post-graduate glassing. The country is big, and these little deer are hard to see. Ted said, offhandedly, that on a good day he expected to glass a couple dozen deer and eight or ten bucks. I didn't believe him, but that was exactly what we saw every day. On that first morning, Charles and I saw our full complement, but by midmorning it was warm and movement slowed. 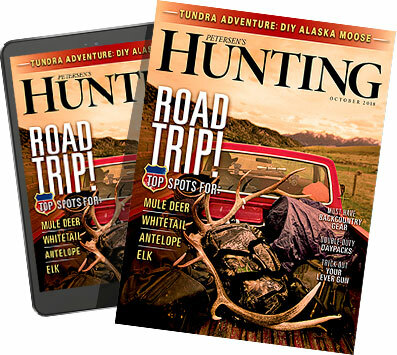 A buck materialized in a grassy swale right below us, tall and perfect, and in possible range at about 400 yards, except he was facing away, looking at a doe. I was uncertain, but it didn't matter. Keeping his rump to us, he followed the doe and was quickly out of sight in a gully. That was a beautiful buck, but it was early in the hunt and we were in the land of giants. I could keep looking, but somebody needed to take the first shot. At a minimum, we had better try to get a better look. Charles and I circled around to come in at the head of the draw. As we closed, we saw the doe and guessed the buck was below her out of sight. I crept forward until the ground started to drop. I pushed my pack onto a bush and started to get into position. I was almost face to face with another doe. She blew up and ran, picking up the other doe, a small buck we hadn't seen, and the big buck. Dodging through brush, they ran across the draw and up onto a big ridge, and then they stopped in some thick stuff, almost invisible. A few minutes later, the big buck walked off the ridge and vanished into dense oaks. By now it was pushing midday and was so hot we assumed the buck had gone to bed in the deep shade. Sooner or later he would reappear. We circled back around and camped out in a shady clump that gave us a good vantage point about 300 yards from where the buck should be. An hour passed, then another. We munched Alice's delicious lunches, wondering if we'd guessed wrong. Maybe give it one more hour. Charles moved to the right to get a better view of a draw that was the only escape hatch. That's when I saw a big buck stroll out of the oaks and saunter down the ridge straight toward me. Charles crawled over while I shifted my tripod and rested the Mossberg .300. The buck must have been following an unseen doe. He was moving with purpose, nose down, in and out of brush. He looked too good to pass, but every time he stopped he was hidden. Out of sight for a few minutes, he crossed the brushy bottom, then stood broadside in an open lane at 200 yards. The setup was perfect, but I knew I wobbled as the trigger broke. The buck jumped high, as if chest shot. There was no sound of the bullet hitting, and he ran left into a thick patch. My brain told me I'd hit low in the chest, but my gut told me I'd shot just under him. If the former, he wasn't going anywhere. We had a good vantage point and should see him if he came out. We waited an hour and were just about to go down and check when I caught movement to our left, across another draw on an ocotillo flat. A doe. Where had she come from? To her right, behind a yucca, were those antlers? There was our boy, hale and hearty, following right behind her. The doe went straight away and the buck followed her, offering nothing until they dropped into another cut at 600 yards. The wind was in our faces, so we went fast across the first cut, over the flat, and then slowed down. As expected, they'd stopped in the next cut, doe visible, buck thrashing a mesquite. When he stepped out, he was still straight away, but just 150 yards and going up the far slope. I had a long, narrow target. This time, the Edge TLR bullet impacted and easily brought down the Gray Ghost. I had glassed, hiked, and hunted hard for a true trophy.